Baton Rouge, LA – August 9, 2016 - Lamar Advertising Company (Nasdaq: LAMR), a leading owner and operator of outdoor advertising and logo sign displays, announces the Company’s operating results for the second quarter ended June 30, 2016. Lamar reported net revenues of $387.5 million for the second quarter of 2016 versus $344.2 million for the second quarter of 2015, a 12.6% increase. Operating income for the second quarter of 2016 was $117.1 million as compared to $99.3 million for the same period in 2015. Lamar recognized net income of $81.9 million for the second quarter of 2016 compared to net income of $59.4 million for same period in 2015. Net income per basic and diluted share was $0.84 per share and $0.61 per share for the three months ended June 30, 2016 and 2015, respectively. Adjusted EBITDA for the second quarter of 2016 was $176.4 million versus $155.4 million for the second quarter of 2015, an increase of 13.5%. Cash flow provided by operating activities increased 19.5% to $159.5 million for the three months ended June 30, 2016 as compared to the same period in 2015. Free cash flow for the second quarter of 2016 was $112.1 million as compared to $101.2 million for the same period in 2015, a 10.8% increase. For the second quarter of 2016, Funds From Operations, or FFO, was $130.2 million versus $104.4 million for the same period in 2015, an increase of 24.6%. Adjusted Funds From Operations, or AFFO, for second quarter of 2016 was $133.7 million compared to $118.0 million for the same period in 2015, a 13.3% increase. Diluted AFFO per share increased 12.3% to $1.37 per share for the three months ended June 30, 2016 as compared to $1.22 per share for the same period in 2015. Acquisition-adjusted net revenue for the second quarter of 2016 increased 3.5% over Acquisition-adjusted net revenue for the second quarter of 2015. Acquisition-adjusted EBITDA increased 5.6% as compared to Acquisition-adjusted EBITDA for the second quarter of 2015. Acquisition-adjusted net revenue and Acquisition-adjusted EBITDA include adjustments to the 2015 period for acquisitions and divestitures for the same time frame as actually owned in the 2016 period. See “Reconciliation of Reported Basis to Acquisition-Adjusted Results”, which provides reconciliations to GAAP for Acquisition-adjusted measures. Lamar reported net revenues of $726.1 million for the six months ended June 30, 2016 versus $646.7 million for the same period in 2015, a 12.3% increase. Operating income for the six months ended June 30, 2016 was $203.9 million as compared to $166.6 million for the same period in 2015. Lamar recognized net income of $133.2 million for the six months ended June 30, 2016 as compared to net income of $100.1 million for the same period in 2015. Net income per diluted share was $1.36 and $1.04 per share for the six months ended June 30, 2016 and 2015, respectively. 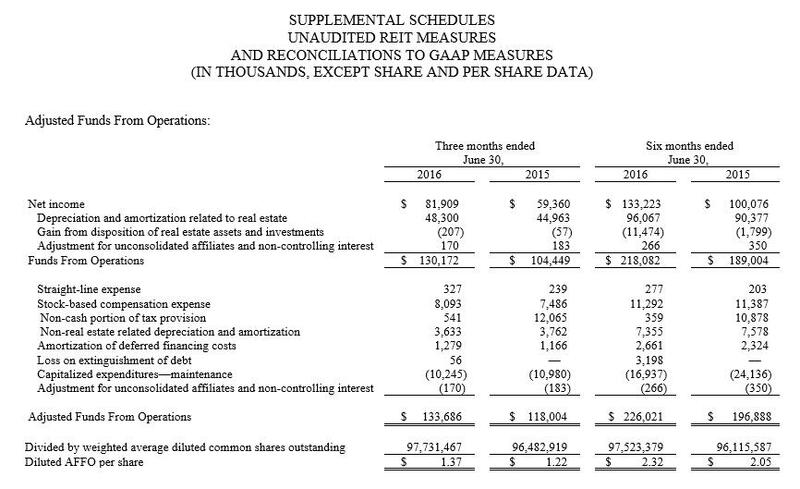 In addition, Adjusted EBITDA for the six months ended June 30, 2016 was $306.6 million versus $273.9 million for the same period in 2015, an 11.9% increase. Cash flow provided by operating activities increased to $211.0 million for the six months ended June 30, 2016, as compared to $188.2 million in the same period in 2015. Free cash flow for the six months ended June 30, 2016 increased 16.1% to $190.4 million as compared to $164.0 million for the same period in 2015. For the six months ended June 30, 2016, FFO was $218.1 million versus $189.0 million for the same period in 2015, a 15.4% increase. AFFO for the six months ended June 30, 2016 was $226.0 million compared to $196.9 million for the same period in 2015, a 14.8% increase. Diluted AFFO per share increased to $2.32 per share for the six months ended June 30, 2016, as compared to $2.05 per share in the comparable period in 2015, an increase of 13.2%. As of June 30, 2016, Lamar had $218.6 million in total liquidity that consisted of $176.9 million available for borrowing under its revolving senior credit facility and approximately $41.7 million in cash and cash equivalents. 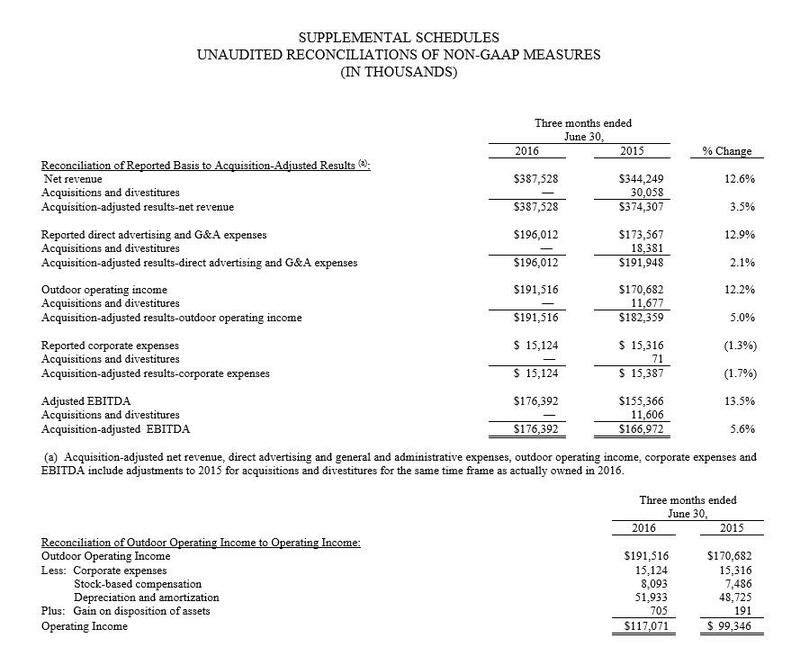 The Company has presented the following measures that are not measures of performance under accounting principles generally accepted in the United States of America (“GAAP”): Adjusted EBITDA (earnings before interest, taxes, depreciation and amortization), Free Cash Flow, Funds From Operations (“FFO”), Adjusted Funds From Operations, (“AFFO”), Diluted AFFO per share, Outdoor Operating Income and Acquisition-Adjusted Results. Our management reviews our performance by focusing on these key performance indicators not prepared in conformity with GAAP. We believe these non-GAAP performance indicators are meaningful supplemental measures of our operating performance and should not be considered in isolation of, or as a substitute for their most directly comparable GAAP financial measures. We use the National Association of Real Estate Investment Trusts definition of FFO, which is defined as net income before gains or losses from the sale or disposal of real estate assets and investments and real estate related depreciation and amortization and including adjustments to eliminate non-controlling interest. We define AFFO as FFO before (i) straight-line revenue and expense; (ii) stock-based compensation expense; (iii) non-cash tax expense (benefit); (iv) non-real estate related depreciation and amortization; (v) amortization of deferred financing and debt issuance costs; (vi) loss on extinguishment of debt; (vii) non-recurring infrequent or unusual losses (gains); (viii) less maintenance capital expenditures; and (ix) an adjustment for non-controlling interest. 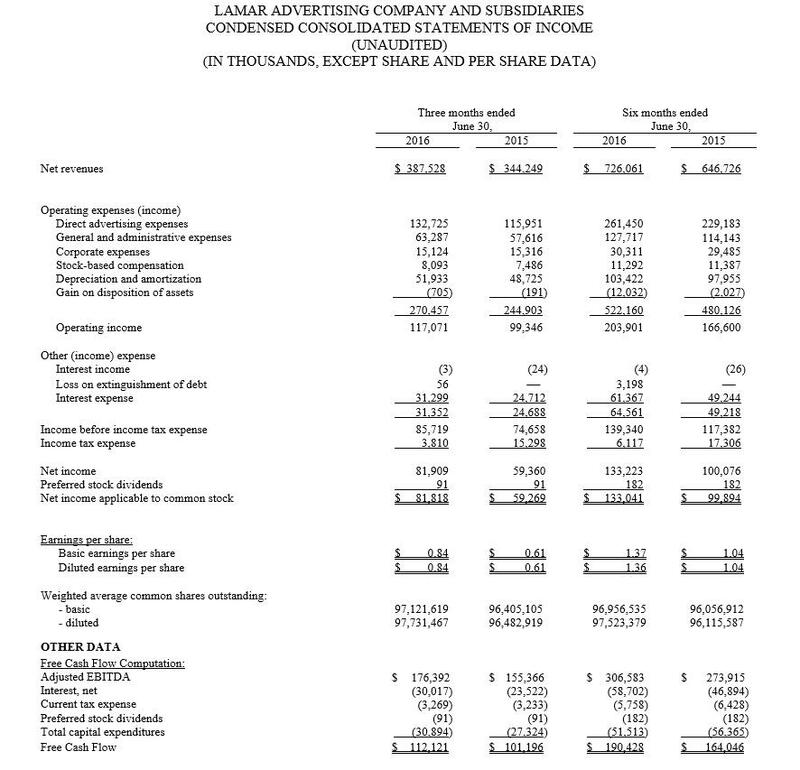 Founded in 1902, Lamar Advertising (Nasdaq: LAMR) is one of the largest outdoor advertising companies in North America, with more than 325,000 displays across the United States, Canada and Puerto Rico. 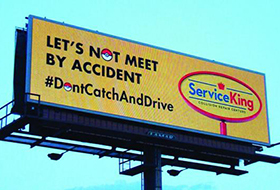 Lamar offers advertisers a variety of billboard, interstate logo and transit advertising formats, helping both local businesses and national brands reach broad audiences every day. In addition to its more traditional out-of-home inventory, Lamar is proud to offer its customers the largest network of digital billboards in the United States with over 2,500 displays.